V.1.1 Update / Now Windows & Mac! TRAVELER precisely models the acoustic phenomenon of the Doppler effect, with a powerful and intuitive graphical path editor to determine a sound's virtual movement. A common example of Doppler shift is the change of pitch heard when a vehicle sounding a horn approaches and recedes from an observer. TRAVELER features a fully fledged 2D path editor allowing you to precisely shape the motion path of the sound source. Further it is possible to freely position the listener in relation to the path. TRAVELER offers intuitive control over the speed of the sound source, path length and the overall doppler path duration. 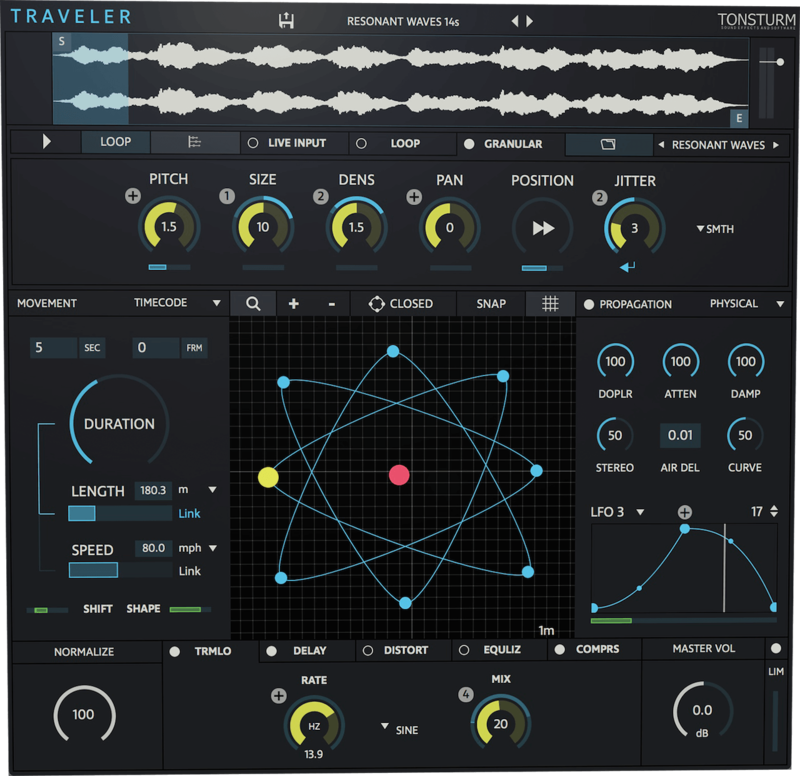 TRAVELER also comes with an onboard loop and granular sample player. The granular sample player allows synchronized playback to the doppler path. This makes it possible to playback the desired sound effect at different durations while remaining everything in perfect sync. New in V.1.1: Precisely define peak time and distanceYou can define the moment of peak and the distance to the Doppler Path and be in precise sync to the action of the video. Painstakingly modeled and physically accurateHighly accurate modeling of doppler shift, distance based gain and air absorption filtering. Full 64-bit processing precision. Graphical 2D motion path editorVery detailed editing of virtual movement. Freely position the listener in relation to the path. Powerful sample playback engineFeatures clean & pure loop sample playback and advanced synchronized granular sample playback. Designed to fit all thinkable scenariosWorks as live insert effect and offers enhanced Audio Suite functionality. Drag & Drop or live record your own sounds. Precisely synchronize the doppler path in timecode, seconds or bars & beats mode. Advanced post effects and modulation possibilitiesComes with 5 post effects and 4 freely assignable multisegment LFOs. Synchronize your modulations in sync to the doppler path. Comes with sound effects and presetsComes with over 80 presets and samples serving as ideal starting point to explore the vast creative potential of TRAVELER. Expand your sonic palette for TRAVELER with sound material from our vast collection of sound effect libraries! By purchasing TRAVELER you will receive a 20% OFF coupon eligible for all our Libraries. - ILOK Version 2 or higher.